Quaint apartment right on the dike. 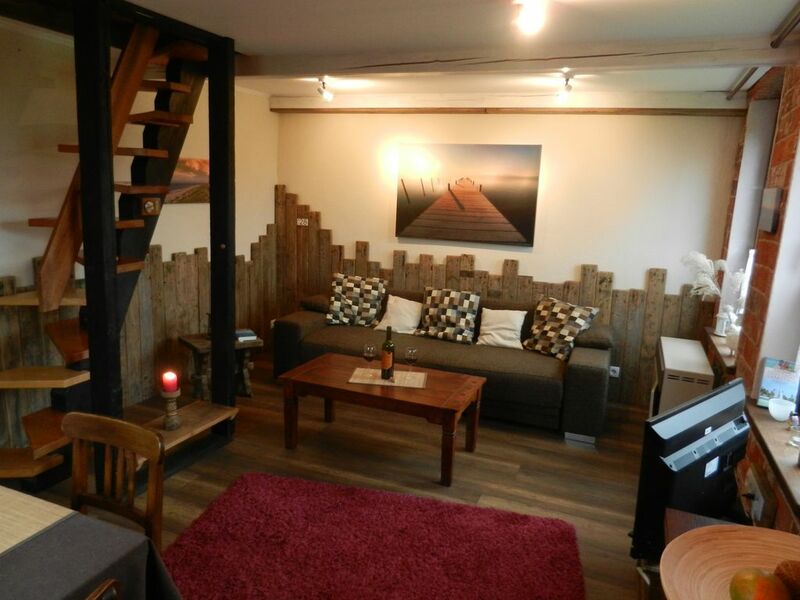 The apartment "Villa driftwood" is located on the peninsula Butjadingen in 1864 built pilotage, right on the dike of the small fishing village Fedderwardersiel. With 3ZKB two WC, it offers 3 people on 2 levels enough space for relaxing days by the sea in a rustic maritime atmosphere. The sofa in the living room is extendable can also be used as a sleeping accommodation. The natural stone walls and the use of saltwater-tanned wooden planks gives this apartment an incomparable maritime charm. The two bedrooms are located upstairs which is reached via a so-called "space-saving staircase" - see picture living room. For children who are not yet able to climb stairs, a little caution is required. The apartment has a cozy terrace to chill and barbecue and a parking space, which is located directly in front of the house. It is only a few steps to the top of the dike, from which you have a wonderful view over the Outer Weser to Bremerhaven. A wonderful place to have the first cup of coffee in the morning, or the last glass of wine in the evening. The idyllic Kutterhafen can be reached in about 10 minutes on foot. The Villa Driftwood is for people who love the original, lots of peace and closeness to nature. For the total rent the legal Kurbeitrag is charged, which is to be paid separately on the day of arrival. Children from 0 - 2 years are released from the guest contribution. On request: "linen package" (sheets, duvet covers and towels) once 10, - per person. welcome to the Villa Driftwood! On the ground floor is the toilet and shower, upstairs a toilet. Es war sehr schön, gemütlich und Erholung pur. Genau das was wir gesucht und gebraucht haben. Wir kommen ganz bestimmt nochmal wieder. Gemütliches, gut ausgestattetes Ferienhaus. Schöne Lage hinterm Deich, nicht weit zum Hafen. Sehr empfehlenswert! Wir haben einen erholsame, 1-wöchigen Sommerurlaub in der Ferienweohnung verbracht. Die Wohnung ist sehr liebevoll eingerichtet und es hat uns an nichts gefehlt. Wir können die Wohnung sehr gerne weiter empfehlen. Schöne Grüße an den neten Vermieter. Der Vermieter war sehr höflich und sympathisch. Die Wohnung ist gemütlich und sauber. Man hat alles was man braucht. Die Gegend ist auch schön. In der Nähe gibt es viele Fahrradwege. Tolle Wohnung / tolle Lage! Tolle FeWo mit Wohlfühlamtosphäre! Einfach alles top! Hafen nur 5min zu Fuß! Das Kompliment geb ich gern zurück! Immer willkommen!